The Flexiwing is the perfect fishing kite for casting you fishing line from a large capacity boat reel. e.g. Penn Senator, Daiwa 6/0 or bigger. These veratile kites can also be used from a Paul's Fishing Kites Beach Reel. This unique small delta kite is manufactured from the highest quality materials and is fast becoming the most popular fishing kite for long distance surf fishing with rods and reels. The Flexiwing Kite can be tacked up to 60 degrees off the wind. Experienced kitefishers can fish a flexiwing kite with the wind blowing straight up or down the beach or at any offshore angle. This kite is also powerful enough to trigger kite release clips and roller trollers so IGFA records can be claimed. 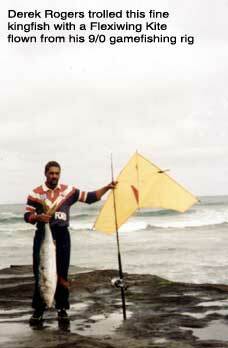 The Flexiwing is the only fishing kite of its kind which can self adjust in varying wind speeds. The Flexiwing Kite is ideal for those who enjoy fishing solo. The complete carbon fibre frame of the Flexiwing Kite results in the lightest, most rigid, kite possible. The rubber bands allow the kite to decrease in wingspan as the winds increase to spill excess wind in extreme gusts. The Flexiwing Kite is best suited to line weights of 20 to 30 kg nylon and will easily tow 5 to 10 hooks up to 1000 metres offshore. The Flexiwing Kite will increase your fishing opportunities from shore with a rod and reel. This kite will fish lighter or stronger winds than the Pocket Sled Kites and will also tow out more hooks. This kite can be tacked up to 60 degrees off the wind when flown without a Skyhook, or over 70 degrees when used in conjunction with the Flexiwing Skyhook. The ability to tack the Flexiwing Fishing Kite in a phenomenal wind range means more productive fishing days for the keen kitefisher. Fishing Wind Range of the flexiwing kite is 4 to 50 knots and the kite is tackable up to 60 degrees off the wind.